/FAQ /How do I manage how many times people can participate in my survey? How do I manage how many times people can participate in my survey? 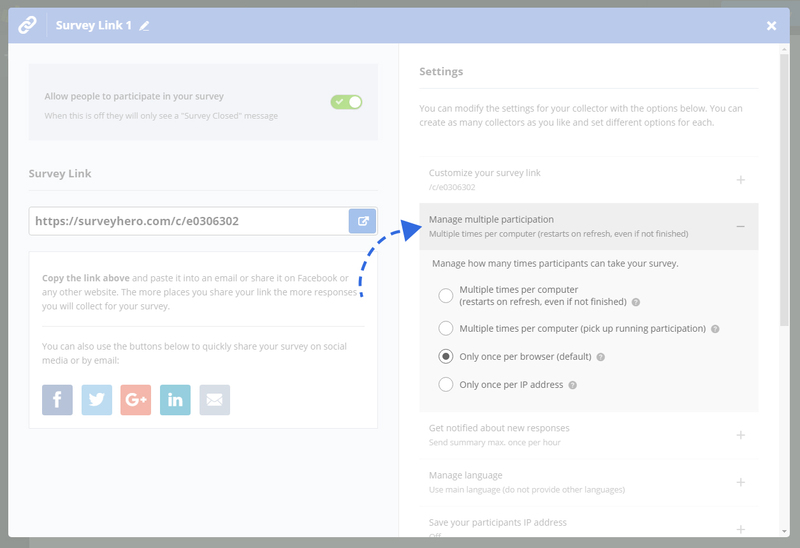 You can control how many times people participate in your survey by changing the “Manage Multiple Participation” setting, found within your collector settings. Whenever the survey link is being opened, whether a previous participation has been finished or not, it will start fresh again and count as a new participation. When opening the survey link, it will pick up any previously unfinished participation on that computer. If there are none, it will start fresh. When opening the link, our system will look for any previous participation with that browser. If there is an unfinished one, it will bring the participant back to the last page they were on. If there is an already complete participation, the user will not be able to participation anymore. This option will only allow one participation per IP address. Be aware, however, that many companies, schools, etc., provide all their users with the one, same IP address. This means that as soon as someone has participated, it will block all other users too. Please be careful with the option “Only once per IP address”. An IP address is not necessarily unique to a user, but often shared among multiple users. In companies, schools, public places, etc., it is common that all users use the same IP address. This means that as soon as one person participates in your survey, all other users will be locked out immediately.